Please make sure that the framework has been properly installed if you wish to follow the guide. For the framework to work, the files from the procedures folder should be placed into the User Procedures Folder of your Igor Pro setup. We will start by creating a simple unit. The natural numbers \(n\) and \(m\) define the carbon nanotube type. \(a_0\) is the unit cell lattice constant of graphene (Understanding the background of the above formula is not required here). If we want to rely on this formula with other calculations, we have to test if the output of this function is both correct and within our required accuracy range. To perform these two tests, we define a Test Case. // this is the same value as for the (9,1) type. The test case testDiameter contains two checks. Both are required to pass the test suite. In the context of this framework we will refer to them as assertions. The first assertion REQUIRE_CLOSE_VAR compares the two floating point numbers within the given tolerance of 0.001nm. The second REQUIRE_EQUAL_VAR uses a mathematical peculiarity of the above formula to check if the calculation gives correct output. The test case function can be placed anywhere inside the main procedure file, but it can be considered good practice to separate test cases into a procedure file of their own. Such a separate procedure file that only contains test cases is called a Test Suite. A test suite can for example perform all the necessary tests for a unit. To execute the test suite we use the RunTest() directive. It accepts the name of our test suite (the procedure window) as an argument. In our example we have named the procedure window "test0". 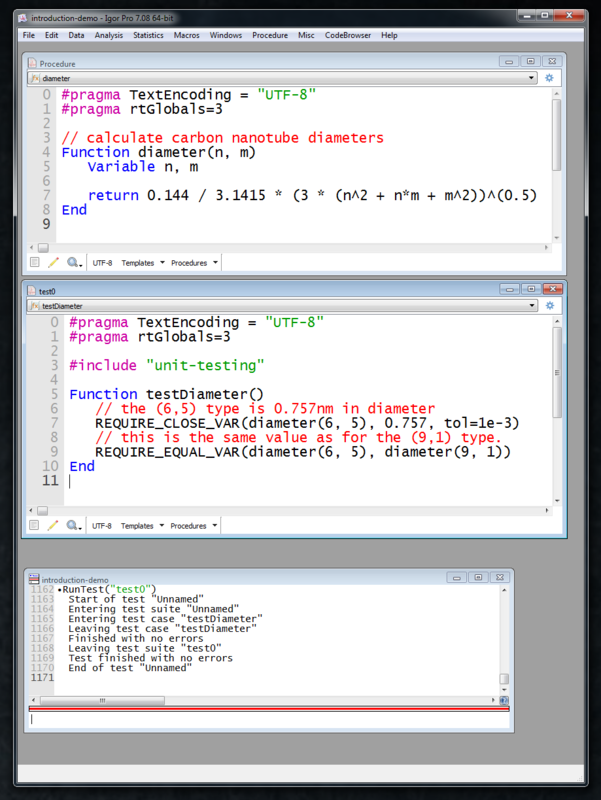 Note, that we have defined a test case for the current capabilities of our function diameter(). The calculation is only exact up to the specified error range. The high error is caused by a fixated value of pi=3.1415. To emphasize this, we can add an assertion to the test case that will fail but will not affect the error counter. Such an assertion is done with a WARN_* directive. Every REQUIRE_* assertion also has a WARN_* variant, see:ref: AssertionTypes for a summary. Assertion "WARN_CLOSE_VAR(diameter(6, 5), 0.7573453, tol=1e-7)" failed in line 11, procedure "test0"
If the program should be extended to a higher level of accuracy, this warning can be set to the corresponding REQUIRE assertion. The program diameter then has to be changed to reflect the new requirement. In the current example, \(pi\) would need to be used instead of only a handful of decimal places hardcoded. In a test-driven workflow, the unit tests get extended before even changing anything at the code base. Defining the test case prior to any code production assures that the software development is not producing unnecessary (and untested) code. A more elaborate example for defining a peak find functionality can be found in the examples section. For a quick start, also have a look at the first example.